To obtain high precise isotopic information from metal element systems, Thermal Ionization Mass Spectrometry is one of the most suited techniques. It consists of a thermal ionization source, where ions are generated and accelerated under vacuum, a magnetic sector where the ions get separated according to their m/z ratio and a detection system where the ions beams get converted to voltage. Our latest generation TIMS is based on more than 40 years of experience in variable multicollector instrumentation and combines innovative features, like new amplifiers equipped with 1013 ohm feedback resistors, with field-proven technology, like the thermal ionization source, variable multicollector system, dual RPQ and compact secondary electron multipliers. We offer flexible and complete multicollector packages that can be configured to best suit the application, including dual detectors (Faraday/electron multiplier), multiple ion counters, RPQs. 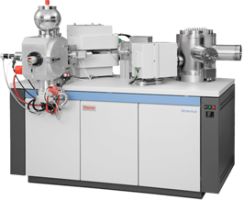 The new 1013 ohm amplifiers add to the flexibility and enable scientists to quantify small ion beams on Faraday Cups.